Home | Steam Rooms & Showers | Installation & Fitting Guides | Steam Room "Fitting At A Glance"
generator steam outlet connected to it. 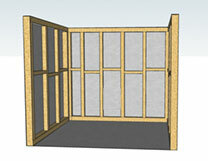 1) Construct any timber / metal studwork / masonry wall that may be required. 2) Install and plumb shower tray or wet room tanked floor. 3) Plumb in shower controls, showerhead and water supply to steam generator plus pipe work for steam outlet. 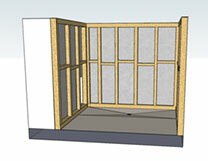 6) Install insulated tanking boards to wall area. 8) Install wall tile or wall covering chosen. 9) Install cubicle or shower door. 10) Fix shower control, steam outlet, shower head and digital control. 11) Connect steam generator to water and electrical supply. 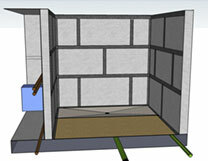 1 - Construct any timber / metal studwork / masonry wall that may be required. 2 - Install and plumb shower tray or wet room tanked floor. 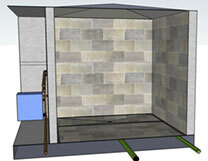 ( A wet room situation is shown for the sake of illustration). 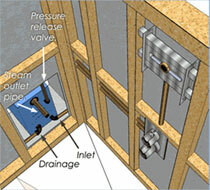 3 - Plumb in shower controls, shower head and water supply to steam generator. (Please note that the generator is shown in this position, but may also be placed anywhere within 3 metres of the steam outlet. 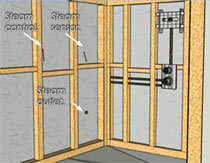 4 - Position wiring for steam temperature sensor ,lighting and steam room digital control (which is to be outside of steam shower area). -Steam sensor to be installed approx 1.2m to 1.5m high. - Steam control wire is to be installed aprox 1.2m high. 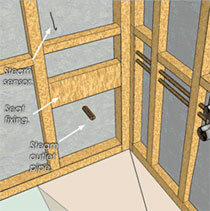 5 - Construct secure fixing for steam room seat (if required). It is recommended that this seat is sighted above the steam outlet. Apply supplied primer to all joints. Allow 3 hours to dry. Overlap joints with supplied tanking tape. 7 - Construct sloping ceiling. A Sloping ceiling is required to stop dripping condensation. 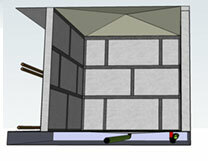 The ceiling can be constructed sloping in all 4 directions (as shown), or in a "ˆ", 2 direction slope. These slopes must be constructed from a waterproof material e.g. solid surface or tanking boards. 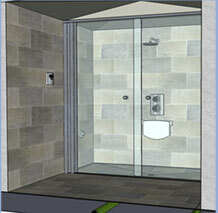 8 - Install chosen wall tile or wall covering. 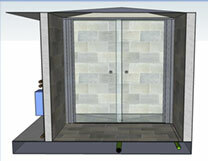 9 - Install cubicle or shower door. 10 - Fix shower control, steam outlet, steam sensor, shower head, digital control and shower seat (if required).